b. 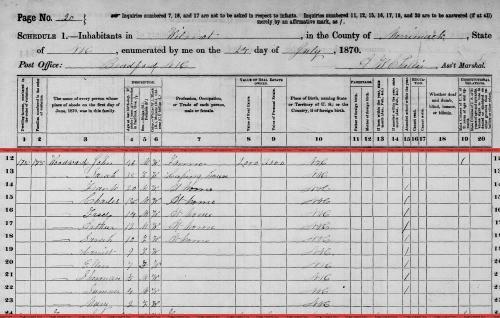 May 9, 1837, d. "18 Feb 186-"
Edward Carleton Moran, Bunker genealogy: descendants of James Bunker of Dover, N.H., Bunker Family Association of America, , p. 161. "Massachusetts Marriages, 1841-1915," database with images, FamilySearch (https://familysearch.org/ark:/61903/1:1:N4FC-9YH : 17 February 2016), Henry Somers Gerrish and Mabel Page Bunton, 26 Jun 1909; citing Boston, , Massachusetts, United States, State Archives, Boston; FHL microfilm 2,315,509. 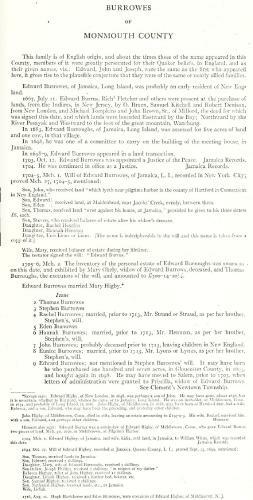 "New Hampshire, Marriage Records, 1637-1947," index and images, FamilySearch (https://familysearch.org/pal:/MM9.1.1/FLX3-YL2 : accessed 28 Nov 2012), Edgar Buntin and Rosa B. Page and null, 1880. 1880 United States. Census Office. 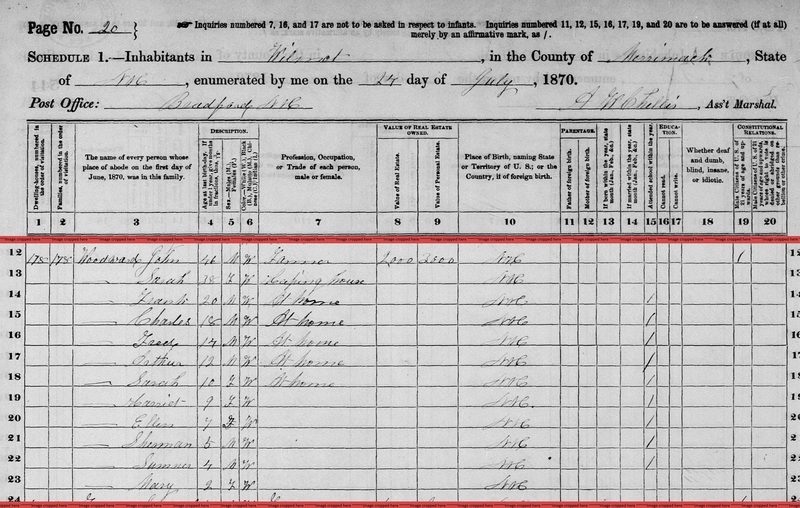 10th census, 1880 federal population census, Washington, District of Columbia: National Archives and Records Service, ([19--]) , Census Place: Manchester, Hillsborough, New Hampshire; Roll: 763; Family History Film: 1254763; Page: 48A; Enumeration District: 124; Image: 0097. Sarah Burnett or Burnass was born perhaps about 1640. 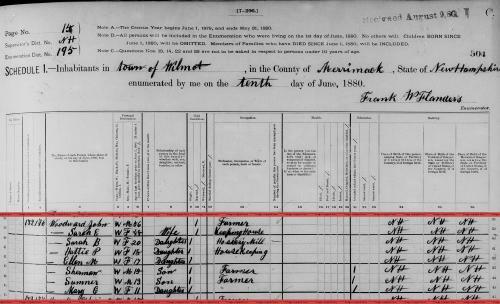 "Maine Vital Records, 1670-1921", database with images, FamilySearch (https://familysearch.org/ark:/61903/1:1:VZ3F-LV1 : 27 December 2014), Burnham, 1900. "New Hampshire Death Certificates, 1938-1959," database with images, FamilySearch (https://familysearch.org/pal:/MM9.3.1/TH-1971-29026-17098-35?cc=1876925 : 20 August 2014), 1948 > No 2443-2779 > image 75 of 682; New Hampshire Division of Vital Records, Concord. "Maine Vital Records, 1670-1921", database with images, FamilySearch (https://familysearch.org/ark:/61903/1:1:2HV7-BJP : 27 December 2014), Susan Burnham, 1831. 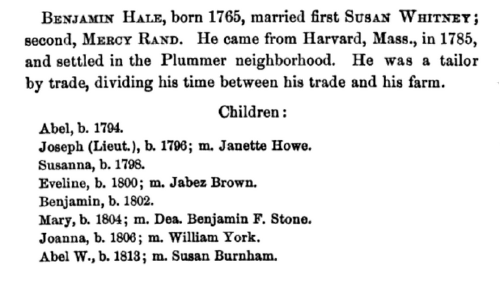 "Maine Marriages, 1771-1907," database, FamilySearch (https://familysearch.org/ark:/61903/1:1:F4X7-K5P : 4 December 2014), Abel W. Hale and Susan H. Burnham, 04 Dec 1850; citing Civil, Waterford, Oxford, Maine, reference ; FHL microfilm 12,625. "Maine, J. Gary Nichols Cemetery Collection, ca. 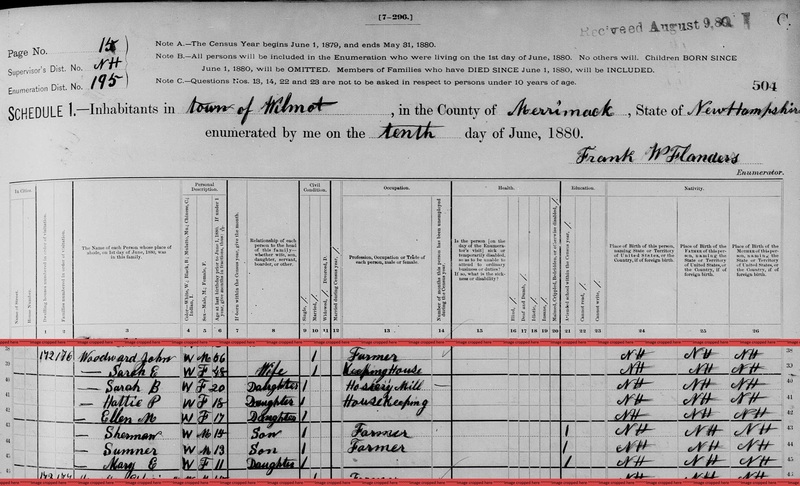 1780-1999," database with images, FamilySearch (https://familysearch.org/ark:/61903/1:1:QKXM-Q6ZS : 9 October 2015), Susan B Hale, ; citing Waterford, Oxford, Maine, United States, Cemetery Elm Vale, Maine State Library, Augusta; FHL microfilm 2,148,871. 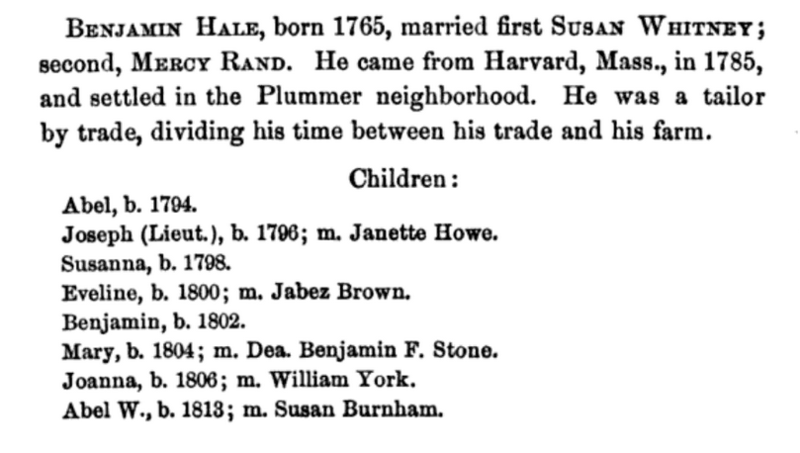 "Maine Births and Christenings, 1739-1900," database, FamilySearch (https://familysearch.org/ark:/61903/1:1:F4S8-9F4 : 4 December 2014), George Francis Hale, 13 Oct 1851; citing Waterford, Oxford, Maine; FHL microfilm 12,625. She was an accountant and a realtor. Margaret married Arthur Chester Woodward, son of Harlow Elliot Woodward and Susan Eliza Howard. Chase's Garage (Wallace H Chase) 885 Main. Chase's Garage (Wallace H Chase, proprietor. garage, auto repairing, auto accessories and agent Oakland car. Main opposite "Golden Hills," Melrose Highlands. Chase, Wallace H (Margaret V) supervisor. house 5 Oliver. Chase, Wallace H (Margaret W) supervisor. house 170 Holbrook. Chase, Wallace W (Margt A) mechanic, Boston. house 1302 Boylston, Upper Falls. Chase, Wallace (Margt) mechanic. house 1561 Washington. Chase, Wallace (Margt) machinist, Wollaston. house 373 Elliot, Upper Falls. Chase, Wallace W (Margt A) machinist, W H Nichols (Wollaston). house 992 Chestnut, Upper Falls. World War I Draft Registration Cards, 1917-1918, at http://content.ancestry.com, Registration State: Massachusetts; Registration County: Middlesex; Roll: 1684684; Draft Board: 28. Ephraim Burridge was born perhaps about 1736. Newton (Mass. ), Vital records of Newton, Massachusetts, to the year 1850, Boston: New England historic genealogical society, at the charge of the Eddy town-record fund, (1905) , p. 373. Eden Burrowes was born perhaps about 1683. Leslie Aulls Bryan, Immigrant ancestors : allied to certain Bryan and Aulls family lines, , at https://books.google.com/books?id=yxU7AAAAMAAJ . Dixon, Ill.: The Print Shop, (1981) , p. 31. Leslie Aulls Bryan, Immigrant ancestors : allied to certain Bryan and Aulls family lines, , at https://books.google.com/books?id=yxU7AAAAMAAJ . Dixon, Ill.: The Print Shop, (1981) , p. 32. 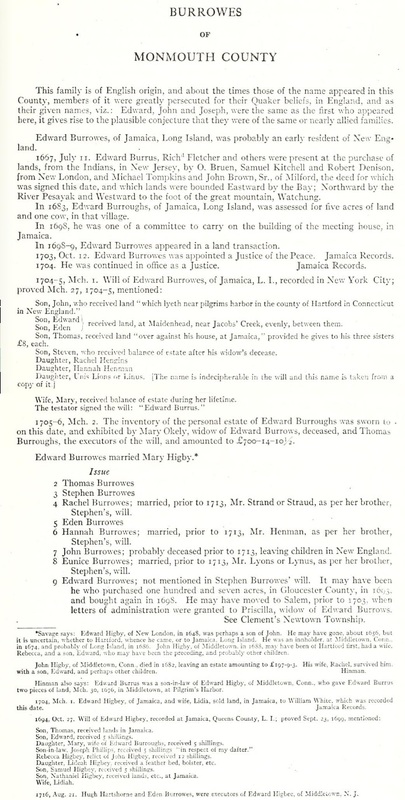 Edward Burrowes was born perhaps about 1691.